Faça as suas memórias românticas da cidade do canal durar para sempre com um passeio de gôndola particular e sessão de fotos em Veneza. If you are thinking about doing this with photoshoot. Please do it!! Our photographer was absolutely incredible. Not just with the photos, but taking us to the most intimate and interesting spots. Marco was awesome to speak to about the history of Vince and Italy. Left there feeling like we made a friend. Can not wait to get our photos. Please do this if you are in Venice!!! The p[hotoshooting experience at Venice was fantastic. Marco, our photographer was amazing - We had the chance to walk around city center (alternative routes) and to enjoy the gondola ride!!! I strongly recommend to everyone !!! Our photographer Marco was amazing. Not only did he take beautiful and special photographs but he was a fantastic tour guide. We loved learning about Venice from a Venetian. He helped us feel at ease while taking the photographs and the finished products were stunning. Do not hesitate to book this deal. It is expensive but worth every penny. This was an AMAZING tour. Our photographer Alberto was so knowledgeable and such a friendly person. We had our 22 months old infant with us and Alberto was so kind and accommodating that he held our sleeping baby in one hand and took pictures with the other. He had an amazing knowledge of Venice and gave his deep insights about each location we visited, taking amazing pictures which, we will cherish our whole life. The gondola ride was an icing on the cake. It was truly an amazing experience all thanks to Alberto. I highly recommend this. My husband and I chose this tour for our post-wedding photo shoot. It was worth it! Best decision ever. Our photographer Giordana Losi and our tour guide I'm so sorry I forgot his name were wonderful. They brought us to the quiet streets of Venice and suggested great poses for us. The photos were beautiful and very well taken and edited. Exceeded expectations! Great for couples. However, try not to wear heels as there is a lot of walking involved. My Husband and I had a wonderful time. Marco you are the best! Marco is so knowledgeable about Venice, and our photos turned out so beautiful. I received so many compliments on the Quality and beauty of the images. This was worth every penny. we booked our photoshoot for saturday. When the photographer noticed that the weather forecasted rain, she asked if we could reschedule. She meet us at our hotel on friday instead. So considerate and kind! Our photographer Beatrice, and our guide Sylvia were both amazing! Beatrice found the most amazing off the beaten path places to capture our little trip to Venice, and Sylvia told us of the history of the places we walked past. Beatrice was very good at finding the right angles, and backgrounds for our photos, and making sure that we didnt have loads of other people in our frames. The gondola ride was amazing! We received a total of 106 photos from our photo shoot, and we are forever grateful! 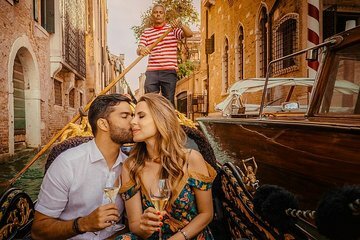 Seeing Venice from the eyes of a locale Venicen and having your photos taken all around the city it was the most fun and lovely tours that I have been on. All I can say that my experience was like a fantasy.